In recent years, construction industry activity has been spread over a period of 12 months. It is therefore necessary to insulate the perimeters of doors and windows, even in winter. Adfast manufactures an insulating foam adapted to this reality. Adfoam 1825 is applicable down to -25 ° C. Even at this temperature you will not see any loss of pressure during application, avoiding wasting of time and money. 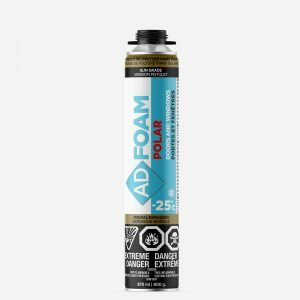 All our insulation foams from the Adfoam range are renowned for keeping constant pressure from start to finish. Adfoam 1825 Insulation Foam has been tested to Canadian CAN / ULC S102 with a flame spread index of 30 and smoke development index of 50. Adfoam 1825 is also tested to US ASTM E84 with a flame spread index of 15 and smoke development index of 35. These standards contribute to the safety of occupants of buildings. Where to apply Adfoam 1825? Adfoam 1825 is suitable for construction applications such as the installation of doors and windows or any other cracks requiring insulation. Adfoam 1825 can also be used in the window and door manufacturing, transportation, HVAC, building materials, prefabricated houses, machinery, agricultural machinery or any other market. On which materials can Adfoam 1825 be applied? Adfoam 1825 adheres to a multitude of materials including aluminum, steel, wood, some plastics and masonry products. If you want to be sure Adfoam Fireblock will adhere to the material you want to use, please contact your technical representative who can do an adhesion test for you.